Christmas Glow is located inside The Enjoy Centre in St. Albert (101 Riel Drive), about a 20-minute drive from downtown Edmonton. 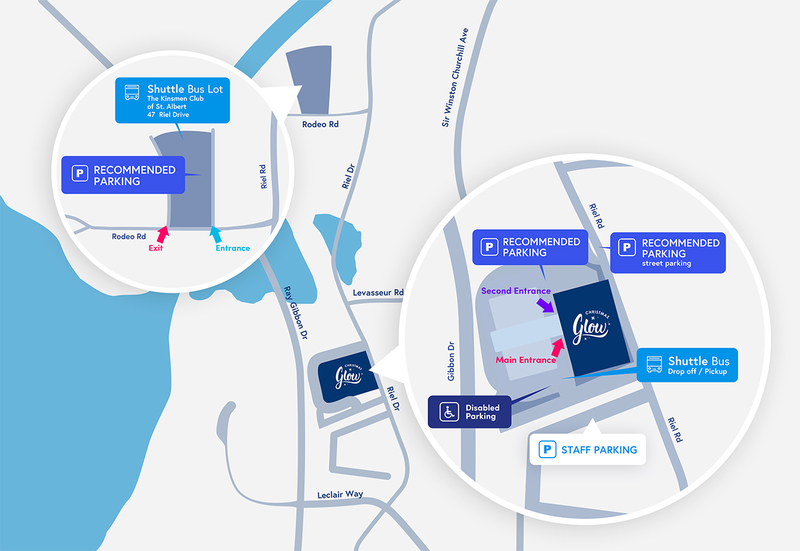 Free parking is available in The Kinsmen Club parking lot (47 Riel Rd.). Complimentary shuttle service is available from 3:35 – 10:30 pm, every 10 minutes. Additional street parking is available on Riel Rd. Bringing a stroller or require extra help? Drop off is available right out front of The Enjoy Centre on 101 Riel Drive. Handicap parking is available in the main parking lot at The Enjoy Centre.